Compartment pressures are not required to make the diagnosis of compartment syndrome however emergency physicians, surgeons will almost always get them to avoid uncessary fasciotomies. Measure compartment pressures whenever you suspect acute compartment syndrome based on risk factors and clinical exam findings. There are no major complications of measuring compartments and choosing not to obtain measurements can lead to missed diagnoses and permanent disability/dysfunction. Zero measurements are needed if the diagnosis of acute compartment syndrome is clinically obvious. Alternatively, serial measurements may be necessary if clinical findings change. The Stryker Device is a type of hand-held manometer which performs direct measurements of compartment pressures. While there are other methods for direct measurement of compartment pressure, the hand-held manometer method is most commonly used due to portability, simplicity, and accuracy. 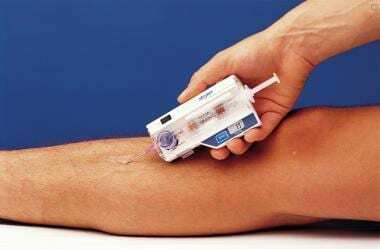 ALTERNATIVE TO STRYKER DEVICE: If you don't have a Stryker Device available, insert an 18 gauge needle into the compartment and attach an arterial line pressure monitor to measure compartment pressures. This can prevent delays in diagnosis. Stracciolini, A MD et al. "Acute Compartment Syndrome of the Extremities." UpToDate, Inc. May 2016. Dr. Wilsey was great in that video. Lose the other guy.